This walk: 2012-8-22. Gorse, bell heather. common ling, Haytor Rocks, High Man, Low Man, Teign estuary, Rippon Tor, Saddle Tor, Bonehill Rocks, Hound Tor, dung bonnet, Emsworthy Rocks, Emsworthy West Quarry, Apache attack helicopter, Emsworthy East (aka Harrowbarrow) Quarry, altocumulus, altostratus clouds, Haytor granite tramway, switching points, St. Winifrid's Church at Manaton, Rubble Heap Quarry, cirrus, stratocumulus clouds, boundary stone, cross-leaved heath, Blacksmith's Shop or Old Smith's Shop B mark, chambered tomb. The lighter flower away from the camera is Common Ling. For a group photograph of all three types taken today, click here. Common Ling, also called Common Heather. Distant view to Haytor Rocks, split into High Man and Low Man by rock climbers. Nearest is Low Man, little seen from the main road at Haytor. In the distance, Teignmouth and the Teign estuary, 12 miles away. Rippon Tor, SX 746 756, elevation 473 metres (1551 feet). As previous photograph - a view of the whole tor can be seen later. Another part of Saddle Tor. View of Haytor Rocks taken to show the pool in the middle distance. Looking back at Saddle Tor, SX 751 763, elevation 478 metres (1568 feet). First of the quarries west of Haytor, known as Emsworthy West, at SX 75223 76833 (where the photo was taken from). From: Phil Newman, The extent of tin streaming and the beginning of granite quarrying.
" .....there are five quarries all together, Haytor Quarry is the largest and most developed, but there was also Hollwell Quarry, which is also a very large impressive quarry, there�s another one called Rubble Heap Quarry, another one called Harrowbarrow Quarry and a fifth one called Emsworthy." Apache attack helicopter, used by the British Army as a "tank buster"
Second disused quarry, Emsworthy East Quarry, also known as Harrowbarrow Quarry, at SX 75325 76885. Switching points on the Haytor granite tramway, at SX 75329 76882. The Haytor complex of quarries was linked by the unique granite tramway, now a scheduled monument. It is 17 km long (10.6 miles), descending 400 metres (1300 feet) to the Stover canal at Ventiford. It opened in 1820 and closed by 1858, with a main line and six sidings to the different quarries. It was built by George Templer and sold later to the Duke of Somerset. The granite venture was eventually closed due to competition from cheaper sources that were nearer the sea, such as with Cornish and Scottish quarries. Looking "south" at the points (in centre foreground) and the ground behind. Zoomed view to the rendered tower of St. Winifred's Church at Manaton, 4.3 km distant (2.7 miles). Another look at the colours of the gorse and heather/ling. Rubble Heap Quarry, taken at SX 75600 77269. Click the image to see a larger version. A view of the rock face. Another look at the clouds, the white-grey fluffy ones are cumulus, probably merging into a layer cloud called stratocumulus. The old "con" trails (condensation trails from the exhaust of jet planes) are a form of cirrus cloud that occurs above 6,000 metres (20,000 feet) although these appear to be lower compared to the usual con-trails..
High Man, Haytor Rocks, SX 7587 7710. The link given before (here) states there are 30 routes in all grades of difficulty up to 80 feet high in this area of the rock. Looking at Low Man, which has about 25 routes ranging from Severe to the higher Extremes! Looking down on Saddle Tor from the saddle on Low Man. A movie panorama taken from the saddle of Low Man, the western rockpile at Haytor Rocks. Beware - there is wind noise! Low Man (Haytor Rocks) with what appears to be an unmarked boundary stone, probably one of 33 between the manors of Ilsington and Bagtor, dating from the C17th and C18th. The boundaries were made more obvious as a result of a survey in 1835. The stone alone (sorry!) at SX 75708 76729 (�3 metres)..... this may be bound stone no. 17, known as "Windsor" on an 1884 map of Ilsington Manor Bounds. Source: Dave Brewer (2002) Dartmoor Boundary Markers, Halsgrove, p. 92. It is also no. 25 on another map (Brewer, p. 98) where it is described as "Black Rock" in 1835 or "Windsor" at later dates, although the map reference (SX 7557 7655) does not agree with the one given here. However, Brewer describes it as being almost covered by vegetation: this stone may simply be an odd stone although it is set like a boundary marker. Looking down on the bound stone - showing large crystals that resulted from slow cooling after the formation of the granite. The composition of granite was described here: 14 March 2012. Cross-leaved heath (left), bell heather (centre) and common ling (right), all flowering at the same time. More details in Heather & Ling (on this web site). A large "B" mark (signifying Bagtor Manor) on a rock structure known as the Blacksmith's Shop at SX 75710 76453. Is there an I (for Ilsington) in the area? Bagtor was recorded in the Domesday Book as Bagethora. This mark is illustrated and described by Brewer, p. 100. His map reference for the mark is SX 7575 7638. Standing on one side of the now-open tunnel entrance into a chambered tomb at SX 75760 76398. An upright slab forming part of the other side of the tunnel can be seen at the bottom of the photograph, one-third the way in from the right. This ancient monument is very overgrown. J. Butler (1991), Dartmoor Atlas of Antiquities I, The East. 1.f Haytor chambered tomb, pages 21-22, describes it as being an entrance grave dating from the centuries around 2,000 BC i.e. 4,000 years old. 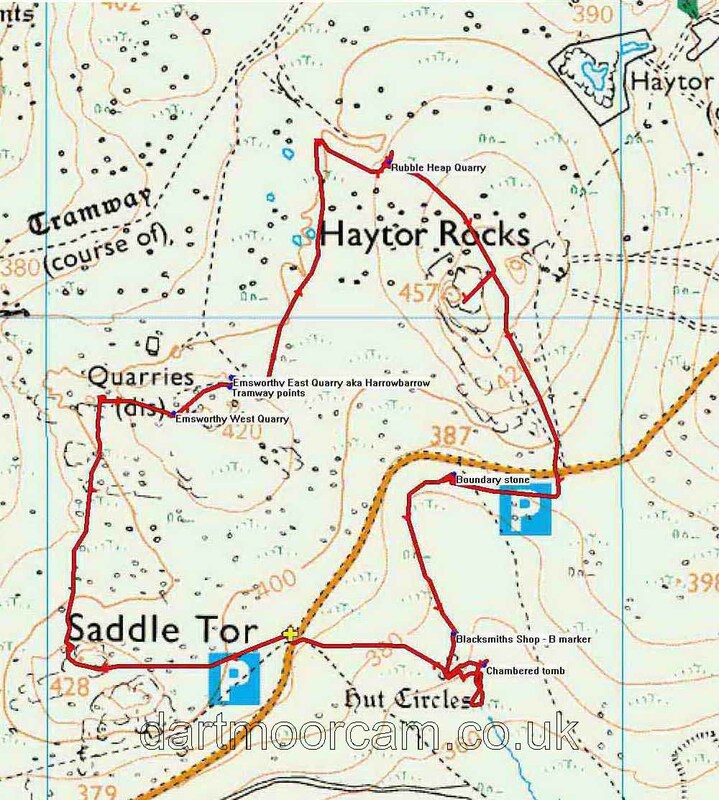 This walk was approached from the Tavistock, Two Bridges and Dartmeet via Widecombe to Hemsworthy Gate towards Bovey Tracy, and stopping at the second car park on the left, the P symbol with a yellow cross on the map.